The cabrio top does not seal up the back end correctly. The curved hoop below the rear window is the "Tension", there small gap between it and the convertible top box lid. The F202 is located on the right side of the frame, maybe 24"-ish from the front edge. It is on a plastic mount that is secured to the frame. The plastic mount can bend/flex so that the F202 is out of alignment and doesn't get "operated" when the leading edge of the top is flat. 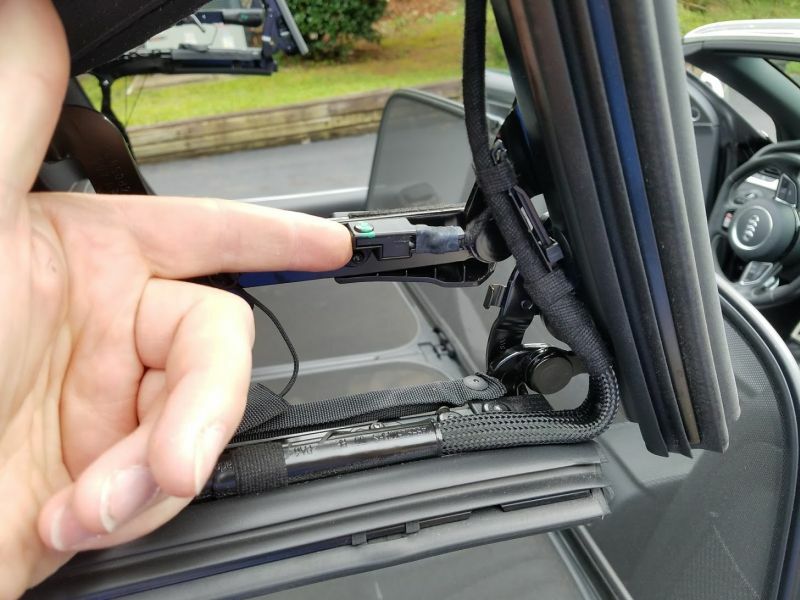 You may be able to grab the frame in the area of the F202 and push/pull on the top that the switch becomes "operated" and then a helper and flip the power roof switch to close and the rear tension will gets pushed down as it should. The fix for this may be as simple as using epoxy to help glue the plastic mount that the F202 is on flush with the frame so it can no longer flex out. Last edited by Jef; 10-30-2017 at 10:36 AM. We can add to that as needed. The F202 location, on the right side of the frame. I've had SSP 960193 The 2010 Audi A5 Cabriolet, 90 page PDF for a few years. You can Google this but you have to join an Audi forum or pay Erwin. I've anyone wants my copy PM me with your email address? Recently had (and finally resolved) this issue myself. There are two torx screws on the interior side of that piece that allow for a significant amount of adjustment. I had to adjust mine a few times (pushing up or pulling down on the roof gently in that spot if it refused to operate). I just moved it a hair each time because I didn't want to risk breaking anything. There's a sweet spot, so when you think you've got it, cycle the roof a few times to make sure it's happy before putting away your screwdriver and laptop. If anyone would like detailed instructions on how to manually operate the roof using the hydraulic motor and the output test of VCDS, please contact me directly and I'd be happy to explain. I've also got the sequence of all switch operations needed for normal opening and closing of the roof, with some approximate timing information. I was recently contacted by another forum member looking for assistance with a 2010 series Audi A5 Cabriolet roof. Until I get around to typing these up in a friendlier format (if I ever do), perhaps my raw troubleshooting notes from last year may be of use to others in the future. I make no promises that any of this is correct, legible, or sensible, but it did help me repair my own vehicle. 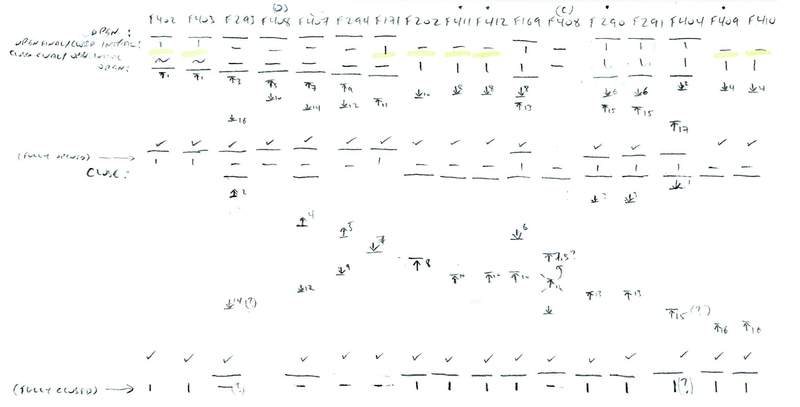 Annotated hydraulic drawings for the opening (4 steps) and closing (5 steps) operation sequences; one step per page. * Note: These may change over time, as I believe my logs from several years ago (after the first module firmware updated that switched to UDS mode) had different numbers. Well this was "fun"... was in the S5 Cabriolet watching data for top operation to verify some things for an ongoing video project... ran the top several times over the course of 15 minutes. Finally got everything I needed, go to close the top... the rear lid closed and locked but the rear tension bow didn't lower. No codes, just a message of "top can't be operated" in the cluster. Can view live data of the switch for power top. Raise windows don't lower when operating the switch for power top. Very generic message in dash saying top can't be operated. About 15 minutes later, top works. It would seem I overheated the pump and it shut down, but it doesn't flag a code for this. Yet another goof by VAG not including a code for "pump overheated, allow to cool"